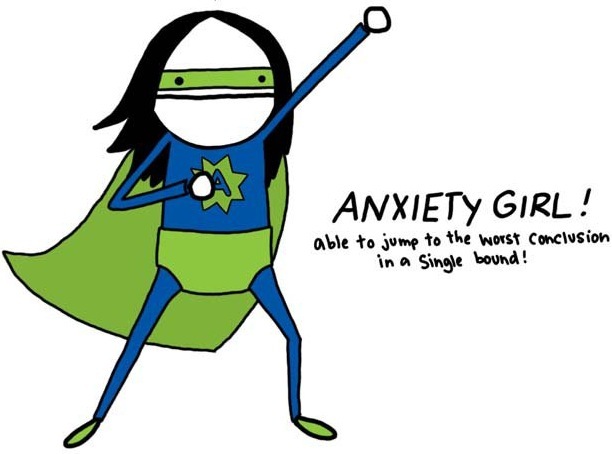 Anxiety girl (this is me)! 1:32am. I’m sitting on my living room couch, trying to differentiate the sounds of the white noise outside from the buzzing inside my brain. It’s another sleepless night with my anxiety, another night that I am unfortunately used to. Anxiety disorders are the most common mental illness in the United States, affecting 40 million adults in the United States (about 18% of U.S. population). Women are twice as likely to be affected as men. I am one of those women. I have always had some sort of anxiety. Through out my life, it comes and goes in great waves, with certain times of the year being more concerning than others. I sometimes think about the kind of person I would be if I didn’t have my anxiety. I think about how I would have longer hair, as I pull out my hair during tense moments (or even moments of boredom or a mental fog). I don’t think I would binge on food and use sweets and salty treats to subdue my emotions and negativity thinking (here’s looking at you, tummy and hip stretch marks). But I do what I can. I watch ASMR videos on YouTube that help me sleep throughout the night. I recently bought a gym membership and I push myself HARD; so hard that most of my muscles throb with pain by the time I leave. That pain leaves me feeling accomplished and let me focus through out the day on becoming mentally strong and building muscles (even though I can barely make it up the stairs). I go back and forth about going on medication (this week, I’m thinking about going on it). But above all else, I remember to be gentle with myself- I let myself go through the motions, dive deep in my problems and swim on through to the other side, ending up “Life isn’t that Bad” Bay. I dry myself off and start smiling again. If you, dear reader, suffer from anxiety, especially in the way I do, my heart goes out to you. I hope that you can find the tools to heal and just know that you are not alone. I had never heard of ASMR before, but it’s fascinating – brains are so complex. I too suffer from anxiety, and I can relate to your experience of needing to cancel plans and then staying inside and feeling awful about it. It’s infuriating and very depressing sometimes. Thank you for writing honestly about your experiences, it makes all of us anxious people out here feel less alone. Thanks, Mary! I hope you’re well.